Grizzly bears moving to Vancouver Island? 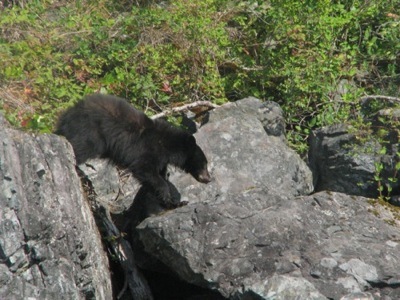 A black bear cub spotted on a three-hour Zodiac trip with Oak Bay Marine Group's April Point Resort & Spa on Quadra Island. Photo by Sue Frause. Dennis Ryan, a friend and former Whidbey Islander, is co-author with Chris Morgan of a fascinating blog titled The Grizzly Bear Outreach Project (GBOP). The most recent post should be of interest to Vancouver Island and grizzly bear fans in general: Grizzly bears go island hopping. "Somewhere in the mist-shrouded rainforests of northern Vancouver Island, a grizzly bear is hibernating in its winter den. And he is the source of mystery, fascination, and even fear among Island residents. As far as anyone can remember or scientists can determine, only black bears have lived on Vancouver Island. But this year, grizzlies have been sighted far and wide on northern Vancouver Island and the knot of smaller islands that press close against the coast between Port Hardy and Campbell River." The blog includes "news about bears, and activities of the GBOP team as they promote an accurate understanding of grizzly bears and their recovery in the North Cascades Ecosystem through community education and involvement."